We are very proud of our Church, its tower and the bells, we would be pleased to show you round. Come and visit us on Tuesdays at 7.30pm or Sundays at 9.15am. Or we can show you round at a time convenient to you, contact us for details. St Mary's has a central square stone tower standing at the intersections of the Chancel, the north and south transepts and the Nave. From inside the church, look up to the ceiling under the tower and you will see a square wooden grill. This grill is actually a trap door and is the hole through which the bells were hoisted into the belfry. To get them out again they would be lowered from the bell chamber through the trap door and down into the church, then wheeled outside on a strong trolley. A bell rope from inside the church goes up and through the grill. 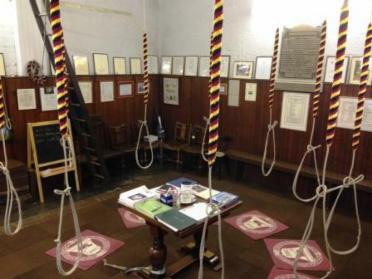 When the ringers have finished ringing the bells, the end of the rope from below is attached to number 3 bell's rope so that someone in the church can chime the bell if required without having to climb the tower. This takes some skill as it's attached to a 5 cwt bell, so do not try it. Access to the tower is obtained from the north side of the building via a clockwise stone spiral staircase. 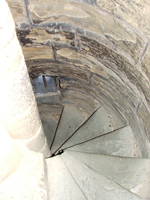 At the top of the spiral staircase is a short stone lined passage and then a flight of straight stone steps which leads up to the ringing chamber door. There are 42 steps from bottom to top. In the wall of the stairs are small open windows, which are now blocked by Perspex and glass. This is because birds kept nesting on the stairs. 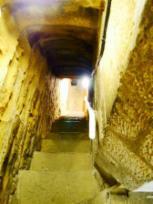 This is looking down the last flight of stone steps from the door of the ringing chamber. The Ringing Chamber is where the ringers stand to ring the bells. The ropes from the bells in the belfry above come down through the ceiling to form a circle in the Ringing Chamber. The floor of the Ringing Chamber is approximately 30 feet above the ground. The walls in here have wood panels and there are bench seats and chairs for people who are not ringing. The room is well lit and heated. It has a square window in the west wall and a small slit window in the south wall under the clock. Ours is one of the largest ringing chambers in the Sheffield area. It is 15 feet from floor to ceiling. In the photo above you can see the bottom of the ladder up to the bell chamber. The mats on the floor cushion the end of the ropes as they hit the floor, this prevents premature rope wear. The clock is a conventional two-train turret clock with one dial on the south wall. The "Going Train" drives the hands round the dial, the "Striking Train" strikes the hours on the Tenor bell. 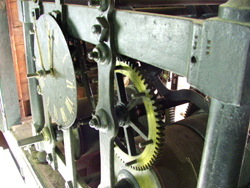 The trains (sets of gears) are held in a solid iron frame in the ringing chamber high up on the wall directly behind the clock face. The clock face is glazed and back-lit at night by an energy saving lamp. The mechanical (clockwork) clock is regulated by a pendulum approximately 8 feet long which takes 1.5 seconds to swing in 1 direction therefore it is said to have a 3 second period. The pendulum is housed in a cupboard in the ringing chamber under the clock mechanism. The clock strikes the hour on the Tenor bell (see below) when it is in its 'down' position. Ecclesfield does not have quarter chimes. Up to 20th March 2007 the clock and the chimes were wound by hand once per week. It is now wound automatically by two electric motors. At the same time It was fitted with a pendulum arrestor which automatically stops the clock to adjust it for GMT and BST. The pendulum is stopped by a motorised arm device which moves over and holds the pendulum at the end of its swing. After 1 hour or 11 hours when the correct time is reached the arm moves out of the way and allows the pendulum to swing again. The clock is kept accurate by a pendulum regulator, a device which moves a small weight up or down the pendulum shaft below the bob to speed it up or slow it down. This prevents the clock time drifting and is controlled by a computer. Inside the ringing chamber another straight wooden 15 rung ladder leads up to a trap door in the ceiling. This is the access to the next level in the tower, the bell chamber or belfry. The bell chamber floor is approximately 17 feet above the ringing chamber floor. This room houses our most important asset, the bells. The space between the ringing chamber roof and thebelfry floor is packed with sound insulation so that the sound levels are not too loud for the ringers. Sound levels in the belfry would damage your hearing. The bell chamber has open wooden louvre windows on each side which let the sound out. Some are partly blocked to reduce the sound level for nearby residents. Whatever the outside temperature is, inside the bell chamber will be nearly the same. The wind blows through, the cold gets in and some say the bells sound better with a touch of frost on them. 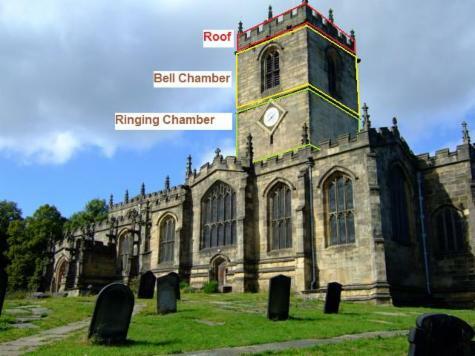 We have a page onthis site that gives detailed information about the bells. In the photo above you can see the Tenor bell in the 'down' position and to the side, the gravity type clock hammer that strikes the hours. Our bell chamber floor is boarded so that access to maintain the bells can be made in safety. However this can only be done when the bells are 'down', in other words in their resting position mouth downwards. Never go into a bell chamber, they are dangerous places. Most of the current metal frame was installed in 1952. It is made from 11 cast iron framesides bolted down to 6 steel 15 inch x 6 inch girders secured in to the walls. Additional prefabricated steel frame sections were added in 2011 as part of the augmentation work to take our 2 new bells. We can control the volume of the sound heard outside the tower by using shutters to block the louvres. In the photo above you can see the shutters in the open position. From the bell chamber another alluminium 18 rung straight ladder leads to another trap door which gives access on to the top of the tower. On the top is the flagpole, several lightning conductors and a marvelous panoramic view of Ecclesfield and the surrounding area. 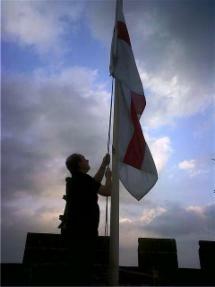 On special occasions and Church Festivals the flag of St George is flown from the flagpole. We fly the Union Flag occasionally for example when the 2012 Olympic Games were taking place. On Trafalgar Day we are allowed to fly the White Ensign as Ecclesfield has naval connections to Admiral Lord Nelson and Alexander John Scott his chaplain is buried in the Churchyard. On Good Friday, Remembrance Day and Remembrance Sunday the flag of St George is flown at half mast. Andrew lowering the flag of St George down the flagpole. 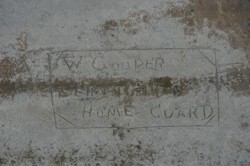 If you would like a conducted tour of the tower, please contact us for details. However, you will not be able to go on to the tower top.